When it comes to eyeshadow palettes, especially high-end ones, I've never actually repurchased the same one twice. Until now. 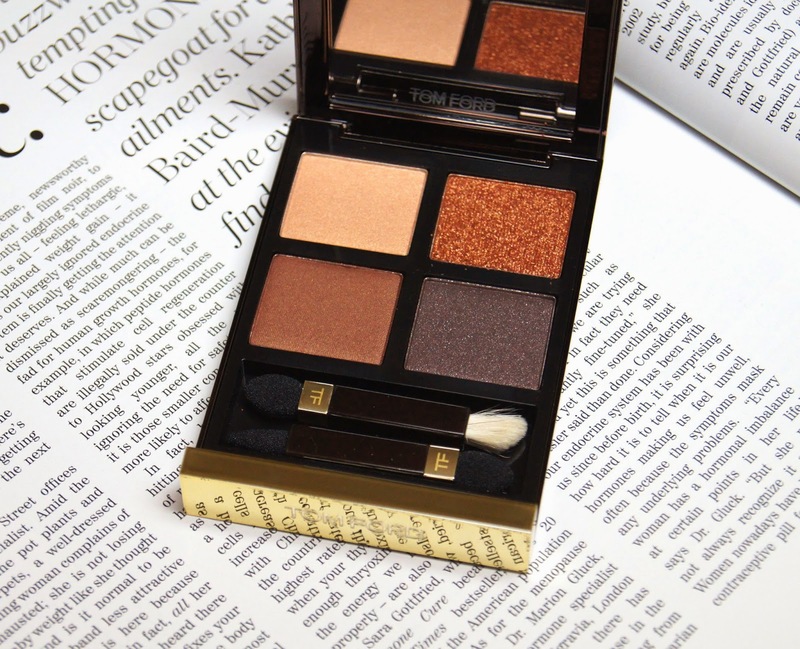 A favourite of makeup extraordinaire Charlotte Tilbury, who released her own range of impressive, suspiciously similar palettes, Tom Ford's Eye Color Quad in Cognac Sable is one of the most-coveted palettes in my collection. Anything from the Tom Ford beauty range just screams luxury, but you wouldn't expect anything else, right? 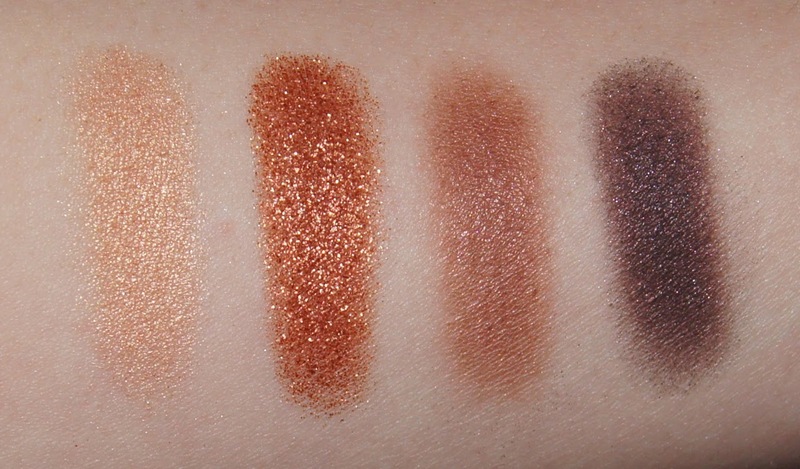 For some, spending £63 on any eyeshadow palette is nuts, let alone when it only contains four shades. Yes, that's a guilt-inducing price, but if you're a beauty addict, you can afford it and you're feeling indulgent, the quality is hard to beat. Now, I'm sure hunting down cheaper dupes for some of these shades, wouldn't be impossible. 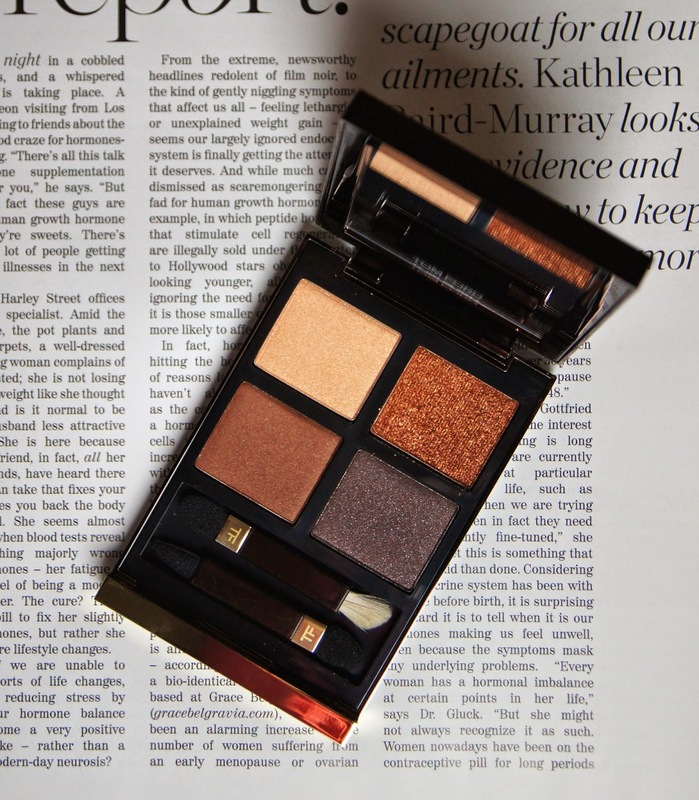 There's a Loreal Color Riche eyeshadow palette in 'Infiniment Bronze' that springs to mind from my own drawers, but it just doesn't compare to the quality of TF's, at all. Sometimes, you just want to use a product that is so ridiculously lavish, purely because it makes you feel good. Come on, we're all a little shallow every now and again. Ideal for day or night, 'Cognac Sable' is full of rich, golden goodness. Strictly warm-toned, this palette is right up my street, but it's a step up from my usual, neutral-heavy styles. With each of the colours containing varying levels of shimmer and glitter, none of them are matte. Ford's entire eye quad range seems to be predominantly shimmery, but there are a couple that contain matte finishes, including Cocoa Mirage, if shimmer isn't yo thaaang. All four of the complementing shades have different textures, but are totally wearable and can be combined in a variety of ways to create a multitude of looks, whether you want something subtle and smokey, or big and bold. Infused with an abundance of warm shimmers, the peachy-gold, champagne shade in the top, left corner of the palette, has a pearlescent finish. Highly pigmented, this shade gives a generous colour payoff even with the slightest touch of a brush. Perfect as a highlight, base or on its own for a wash of colour, it's not too pale or frosty. Stealing the spotlight next to that, is the burnt-orange, copper glitter, which is the star of the show. Despite it being quite chunky, the texture isn't at all gritty. Applied lightly, a thin veil of glitter is left behind, but it can be built-up to an opaque finish, when packed on with a flat brush. As the glitter is pressed, it doesn't create a tonne of frustrating fall-out, as long as you don't swirl your brush into it. In the bottom left corner, there's a muted, warm, mid-tone brown that has the smallest dusting of golden shimmer running through it. Having a satin finish, this isn't as soft in texture as the other shadows in the quad and has a sheerer finish, but it's still easy to blend and build with. If you're simply using the one palette for a whole look, then this is a great shade to add definition in the crease, as it's the least sparkly of the four. Finally, to the right of that, there's a rich, plum-brown, full of multi-tonal shimmer. A refreshing addition, it's more exciting than a standard, dark brown. When the light catches it, you can pick up flecks of gold, violet, green and pink; it's truly stunning. You need a light-hand with this one, though, as it's so pigmented and can easily leave you looking like you've been in a boxing ring. Soft and velvety in texture, the shadows almost feel creamy to the touch and just melt onto the skin when applied. The chocolate brown shade may not be as buttery as the rest, but it's still an impressive formula. With barely any effort, they blend in seconds and take very little work to look amazing. Usually, when creating a dramatic, evening, eye look, leaving your base application until last is recommended, to avoid being speckled with excess eyeshadow on your cheeks for the rest of the night. 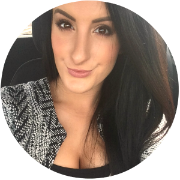 But, when using this quad, there's never any fall-down, so I can easily refresh and take my makeup from day to night, without having to start from scratch. If I'm heading out somewhere special during the day or night, this is a palette I turn to as it really gives that wow factor. Without prepping with a primer, the shadows are vivid, but using a creamy base first really enhances the intensity and sparkle. As my eyelids aren't particularly oily, the wear-time on me is spot on, with only very minor fading after nine hours or so. These quads are just so decadent and, of course, the art-deco style, embossed packaging reflects that. The palette is big, weighted and the magnetic close is just so satisfying. I don't mind that it takes up so much room in my makeup bag when I'm traveling, as the large mirror that's hidden in the lid is a god-send. Although, they could easily cut the size down by an inch or so, by getting rid of those ridiculous, sponge applicators that no-one ever uses. Even Tom Ford hasn't got those miniature 'brushes' down. 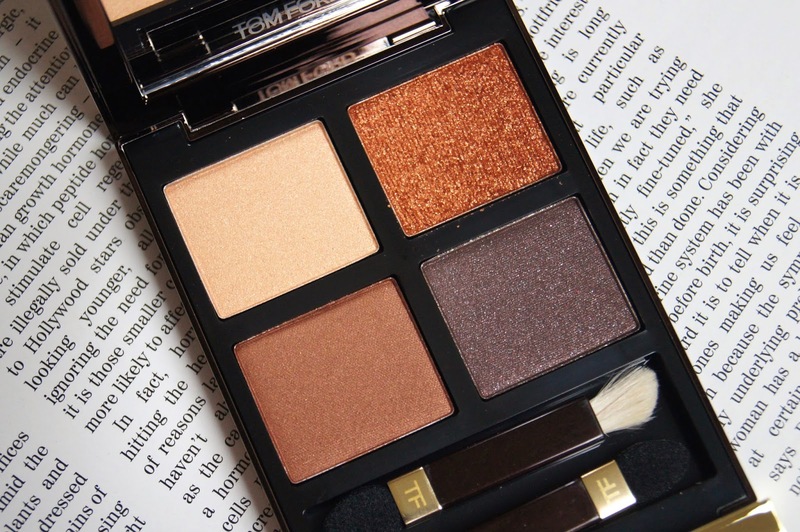 What do you think of the Tom Ford Eye Color Quads? Are they worth it? Stunning set of shades, one of the Charlotte Tilbury Palette is quite similar though cheaper by TF standards but I did wince paying £38 pounds so I don't think I could handle dropping over £60, unfortunately. Oh my god this is absolutely stunning. I never tried TF beauty products. The shades are just gorgeous!! I love TF, but I haven't tried their quads. But their lipsticks are to die for! I haven't ever spent that much on a quad, but I know that it will happen eventually. Tom Ford does scream luxury, and these shades are just gorgeous. I'd be scared to even touch it!